The Toyota Tacoma is one of the most famous overloading vehicles on the market. In recent years they have also become one the most popular “prerunning” vehicles in the world. After you’ve bought some nice suspension and bigger tires, it may be time to buy some upgrading lighting. 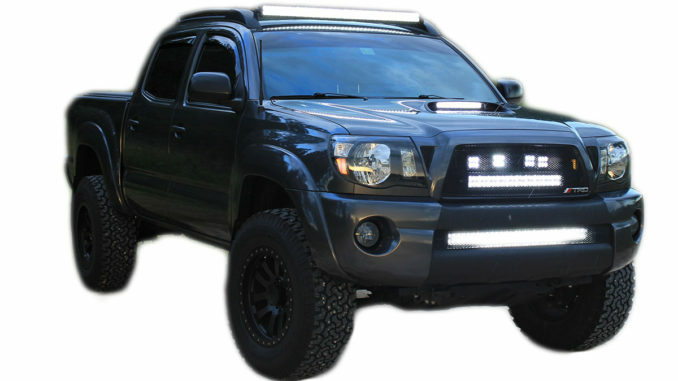 In this short guide, we will cover the best LED light bars for your Toyota Tacoma. We’ll also cover the best light bar brackets and the best aftermarket taillights. Mounting a light bar low on your truck can create shadows which can make driving at night more difficult. One of the best things about roof mounted light bars is how they help eliminate shadows on the trail. You are forced to drill holes in your roof if you use the brackets that come with your light bar. The weight of the light bar on the sheet metal will cause large dents which are expensive to repair. For this reason, we will focus on light bars you can get custom brackets for. We also understand that you may not have a lot of money to spend so we will also include cheaper alternatives. We love Rigid Industries products. Not only are they brighter than almost any other light bar on the market, but they’re also tough. This kind of quality doesn’t come at a cheap price. If you know a Rigid Industries product is out of your price range, don’t worry we have some cheaper alternatives below. 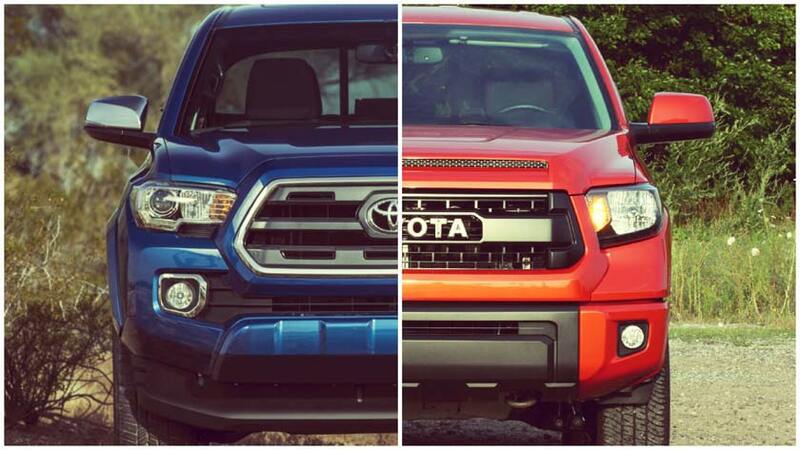 Tacoma’s are superb for prerunning, and prerunning requires a bright light bar so you’re not driving blind. This 40” RDS-Series from Rigid outputs an impressive 20,920 lumens at 300W. Plus, with their projector design, the light pattern is tight and helps illuminate far down the trail. We chose the Midnight Edition because it looks way cooler than the standard chrome light bar. We know a lot of you Toyota guys out there like to beat on your truck and so does Rigid Industries. That’s why this light bar is dust, water, and shockproof. Plus, if you can ever break it, it’s covered by a lifetime warranty. Second on the list of light bars is a much more budget-friendly product from Rough Country. If you plan on doing simple trail riding or overlanding, you won’t need a light bar with a super tight beam pattern like the 40” RDS from Rigid. You still want decent build quality, but beam pattern isn’t such a big issue. This light bar from Rough Country uses a unique “X” design for the diodes. This allows Rough Country to fit a third row of diodes which increases total light output at the expense of a less tight beam pattern. The light bar out 21,600 lumens at 240W. It’s also water and dust resistant with a limited three-year warranty. For the price, this light bar is hard to beat. Third on our list is another product from Rough Country. The “X” design on the light bar listed above is fine for trail riding, but it can’t project light very far. We chose the standard version of their curved light bar which should theoretically project the light further out. Part of the reason we chose the Black Series is that of how much better it looks than the standard Chrome version. This light bar from Rough Country outputs 19,020 lumens at 240W which isn’t super amazing but it should project the light further out. It has an IP67 waterproof rating which means it’s water and dust resistant. It’s all covered by the same three-year warranty as the X5 series. Last but not least on our list is the 5D Philips from Auxbeam. This light bar uses tight projectors which will send the light much further down the trail while also being cheap. Unfortunately, this exact light bar only comes in a straight design so it won’t look nearly as good as any of the other light bars. This light bar outputs a claimed 28,800 lumens at 288W, but it’s probably closer to 23,000 lumens. This is because Auxbeam won’t list the numbers from a proper light output test, but rather the estimated output of all the LEDs combined. Like I mentioned above, the 5D design helps project the light in a tighter beam pattern great for high-speed prerunning. Unfortunately, the low cost comes at the price of quality. Auxbeam backs this light bar up with a short one-year warranty and mentions nothing about water and dust resistance. I wouldn’t purchase this light bar unless you’re okay with a questionable product. The Rough Country light bars cost little more and have a much better warranty backing them up. Like we mentioned above, bolting a light bar directly to your roof with the included brackets is a terrible idea. Not only will it look ugly but it will also put massive dents in your roof. Plus, if you ever remove the light bar for any reason you’ll have two large holes in your roof where water can get it. These brackets from Rough Country are cheap and bolt to your factory roof rack. This will save you from roof dents and drilling holes directly on your roof. Plus installing these brackets will be way easier. The brackets are made of steel and covered with a black powder coat finish so you won’t have to worry about them bending or breaking. If you end up going with the 50” Auxbeam light bar we recommended above then you’ll need these brackets. They perform the same job as the brackets listed above but they are specifically designed for a 50” straight LED light bar. They also make these brackets from a tough full steel construction so they won’t bend. They’re also powder coated black so you won’t have to worry about the paint chipping off over time. Although roof-mounted LED light bars are great at eliminating shadows on the trail, they have one major design flaw: windshield glare. This happens when the light emitting for the LED light bar shines down onto the windshield. This can make it harder to see at night especially if you’re driving in lots of dust. A light bar mounted on your will not cause any windshield glare, so it may be the better option for you. Once again we will recommend a Rigid Industries product because of their insane light output and quality. Mounting a light bar on your bumper makes it much more susceptible to getting hit by stuff (rocks for example) so you’ll want a tough light bar. Mounting a light bar inside your bumper requires a single row light bar which is also why we picked this one. Unfortunately, this light bar is a little expensive so we’ve also listed a cheaper alternative below if you’re on a budget. This light bar from Rigid Industries outputs 11,250 lumens at 118W which is an impressive lumen/watt ratio. We recommend the Midnight Edition because of its awesome looks. You won’t want a shiny chrome light bar when trying to keep it semi-hidden in the bumper. Just like any other Rigid Industries product, this one is water, dust, and shockproof. It’s also backed up by Rigid’s lifetime warranty. Unfortunately, the Rigid Industries light bar is very expensive. You get what you pay for, but not all of us can pay for high-end LED light bars. Fortunately Rough Country makes a budget-oriented product which works well. This specific light bar uses a single row design necessary for mounting inside a Tacoma bumper. We picked the Black Series because of its awesome blacked out looks. Plus, it comes with a nifty light bar cover for when it’s not in use. This LED light bar from Rough Country outputs 12,000 lumens at 150W which is actually 750 lumens more than the much more expensive Rigid Industries light bar, but it requires more power than the Rigid Industries bar. It’s covered by the same three-year warranty as the other Rough Country LED light bars we listed above. It’s also water and sun resistant with its IP67 rating. These custom-built bumper brackets make installing your 30″ light bar on your Tacoma simple and clean. They give an almost factory look to the front of the truck so you won’t be attracting too much-unwanted attention after you park your truck. They construct these brackets with high strength steel so you won’t have to worry about them failing on the trail. Mounting them couldn’t be easier as there are no holes to drill just a couple screws and you’re good to go. If you’re still unsure what LED light bar you want to buy be sure to check out our full Light Bar Buying Guide for more information.